From the first poem in this collection and the paradoxical idea that the night sky is, ‘as private as / Krishna’s inside cosmos’ (‘Navigation’, p. 5), I felt conscious of a unique point of view. This feeling was immediately embellished by, ‘Poema: Lessons in Japanese’ which includes the beautiful metaphor for painting, ‘The pieces he collects are to taste’ (p. 7). The poet is watching and learning from an artist. The narrator wants to borrow his whole approach for her writing practice, as much as for her attempts at painting; she notes, ‘A brush has its own pulse to record and amplify. / A pen has its own rust.’ She is entranced, watching him test paint on his own arm, which can’t easily be ‘blocked out’, presumably by another test, or some other movement faintly alluded to. She wants to ‘Write like seeing’, and it’s even possible that she might succeed in adopting his attitude whilst the paint is drying. This encounter might represent a total ekphrasis, a fusing with the methodology of another art form. She looks forward to working with the ‘fresh blank book’ that is this new opportunity. Reading Hummel offers that pleasing sense of getting to know a writer, and making that possible is her great honesty concerning the human condition: ‘I tend to seek out a view alone, / then crave distraction from it’ (‘Paradise Inn’, p. 22). If the expression here were described as confessional it would limit the perception of its scope, since that word seems tainted by those who have objected to confessionalism, and sometimes for good reason. Perhaps a better word would be admission – especially since that has another meaning for access, accessibility and permission. In ‘Letter of Farewell before a Journey’, a feeling of deep woundedness precedes the description of the voice’s skin that is, ‘a country of Biblical proportions’ (p. 11). This line manages an allusion to colonisation, as well as acknowledging what’s deeply problematic in being bound to another in feelings, together with the frightening implications of being unbound. In the struggle, she writes, ‘he’s still me’, but he makes no reply, and it’s easy to visualise a vast empty space, despite the fact that the skin seems to spread out in all directions. In ‘Testerio’ she marks the seeming pleasure of the (cat) fight between the sexes. In the whimsical short poem ‘Proposal Refused’, a fish gives its reason for not marrying as ‘I’m of the sea: you, the cloud’ (p. 12). The fact that the (probably) human subject is seen as being of the cloud, rather than the earth is unexpected, and all the air-like words we might associate with cloud, lightness and flimsiness come to bear. Relationship issues are again suggested by, ‘Regret is the solitary muse of the regretful,’ and, the marvellous phrase, ‘the affront of my bleakness’ (‘Paradise Inn’, p. 22); a villanelle also talks about the threat of regret. These issues are commented on more explicitly later, in the lines, ‘Nearing sixty she can see no point in waiting for / At Last her Love to Come Along – nor can she advance’ (from ‘Reflections in Baubles’, p. 74, an intriguing set of juxtaposed snippets). There’s much humour here and cultural mismatching. A westerner, perceived as fat by an Indian is described as ‘stranger to / the road you sink your weight upon’ (‘Fatty Sobji’, p. 15), which indeed makes us see the incompatible nature of our relationship with the earth. Part of me wants to know exactly what she means by the abstractions here, and part of me is happy to sit with the problem and see if I can’t tease it out a little further. Such puzzles seem more obviously part of the predicament of life in lines like, ‘Fulfilment should be more than just / a double negative of what we have not got’ (‘Last Drinks in Adelaide II’, p. 33). I’m not a great fan of introductions and feel that most could be postscripts so my only complaint about the book is that the writer’s introduction gave me to expect rather less than the poems succeeded richly in delivering. 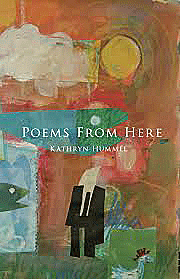 The positioning of poems as being from ‘out there’ or ‘in here’ seems relatively arbitrary, and I thought the poems spoke so well for themselves that the descriptor only detracted. To my mind, this is a thoroughly convincing collection of poems.